Considering he almost severed an arm in a horrific 2011 rally crash, it would’ve been easier for former Formula One regular Robert Kubica to leave “former” in his title. But Kubica, who entered a race before he even regained full mobility in his arm and won it less than two years after the crash, isn’t that type. That sentence probably holds a lot more weight now that Kubica finished the test, since his times looked great—especially for someone who hasn’t competed in a modern F1 car due to being out of the seat for years. The last time Kubica competed in the series, F1 cars were V8s instead of V6 turbos. That should give you enough of an idea about how different things are. Kubica was a young, up-and-coming Renault F1 driver at the time of the rally crash that took him out of his F1 seat. He was 26, and in its report after the Feb. 6, 2011 incident at the Ronde di Andora rally in Italy, The Guardian questioned the racing future of “one of the most promising” drivers in F1. A guardrail impaled Kubica’s car, and he was stuck in the car for more than an hour before being extracted. 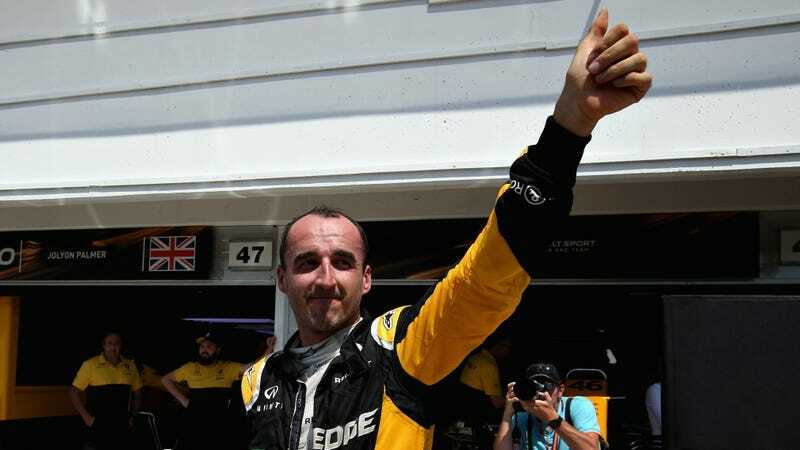 The Guardian reported at the time that the use of Kubica’s right hand “was saved only after seven hours of surgery.” He had leg and arm fractures as well, but the New York Times reported that doctors thought he could make a comeback. That he did—just not fast enough to keep the F1 ride. Fill-in drivers had to take Kubica’s place throughout 2011, and Kimi Raikkonen got his seat when Kubica didn’t recover from his injuries in time to make the 2012 season. Kubica made his return in rally, winning all four stages of his first race back before he’d even fully recovered from the wreck. Kubica jumped around for a few years, racing various series and types of cars before this recent F1 test. ESPN reports that after the test, Kubica said the new race cars “are even more demanding than previous cars.” But it really didn’t show, because his times were up there with that of current full-time drivers. But for the record, Nico Hulkenberg’s Q3 time was a 1:17.468 on super-softs (good enough for seventh on the grid) and Palmer’s Q2 lap was a 1:18.415 also on super-softs (good enough for 11th on the grid). Kubica’s fastest time on the super-soft compound was a 1:18.952 set on the first flying lap of a five-lap run at 16:26 in the afternoon. All Kubica’s fast laps were set on five lap runs with an outlap, a first flying lap, a cool-down lap, a second flier and an in-lap, whereas Renault conducted its qualifying laps on Saturday with a simple out lap, fast lap and in lap to minimise the fuel load. But a 17-lap run on a relatively empty race track in testing is quite a different proposition to Palmer’s stint in a race, which is not only was longer at 23 laps but also involved getting stuck behind Daniil Kvyat towards the end, obeying blue flags and monitoring a power unit that is intended to last — on average — a quarter of a season. ESPN has a few more comparisons, if you’d like to read here, but the overall conclusion was that Kubica could be competitive with the times he was running. Kubica’s only real mistake, he told ESPN, came when he pulled out of the garage for the first time. He misjudged the size of the new race car, clipping the wall and knocking a sign with Renault driver Nico Hulkenberg’s name and face from where it was hanging above the garage door. What’s The Greatest Comeback Story In Motorsports History?